You are currently browsing the tag archive for the ‘fish & chips’ tag. 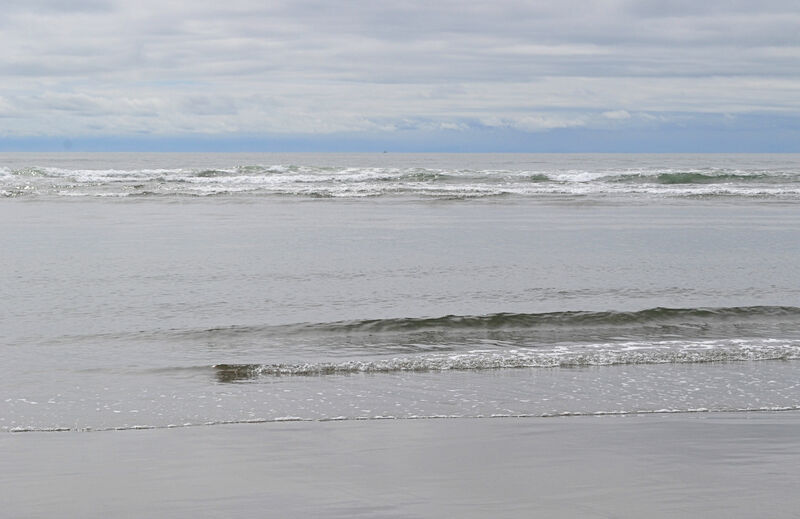 We live close to the Pacific Ocean, so that destination had to be on our itinerary. For our last day of mini road trips, my friend Vladimir and I headed to the coast. Isn’t it wonderful how many different kinds of experiences we were able to have in only five days of travel? Almost each day began at our own doorsteps. It is like living in Paradise. Vlad is new in the area and doesn’t have a car, so we made a plan to do a week’s worth of mini-road trips so he could see where he lives. Since I have the car, I got to plan the trip. Monday we went to Mt. St. Helens to see what the volcano looks like 38 years after an eruption (hint: it’s beautiful). Tuesday we drove into east central Oregon to the John Day Fossil Beds National Monument to explore desert geology and the history of that particular region which holds an exceptional collection of Cenozoic Era fossils. There were many places to explore in that region, and it is a four-hour drive away, so we stayed the night out there. That allowed us to hike and find fossils for two days. Thursday we drove out to the most commanding volcano in the region because of its proximity and its beauty: Mt. Hood. Friday morning we drove out highway 30 in hopes of catching a ferry across the Columbia River. I have not taken the ferry before and thought it would be fun. Since I live on highway 30 and Vlad hadn’t been to my house in about a year (because he has no car), we stopped by “real quick like” and see the latest changes at my farm. It was a fun visit, Racecar said hi to Vlad, and off we went. But it was 5 minutes too late, and we arrived at the dock in time to see the ferry tenders locking the gate and the ferry departing. Bummer. I had the idea of making a loop, so I thought we could reverse direction and if things worked out ok, we could just catch a return ferry from the Washington side into Oregon on our way back. It was a short drive to Astoria from there, but it was midday and we were already hungry. We decided to eat first before anything else. 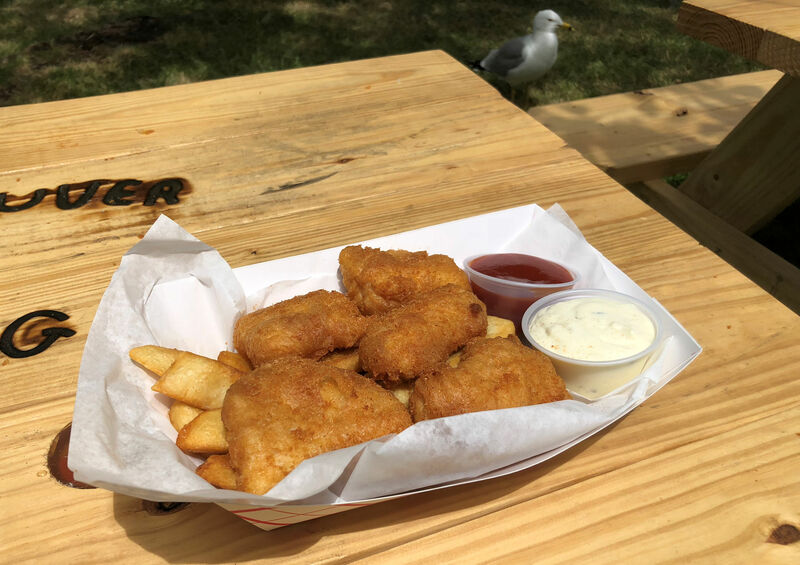 While at the Hotel Condon, we spoke with other guests who raved about the fish&chips place across from the Astoria Maritime Museum. That was as good a reason as any to go find it. 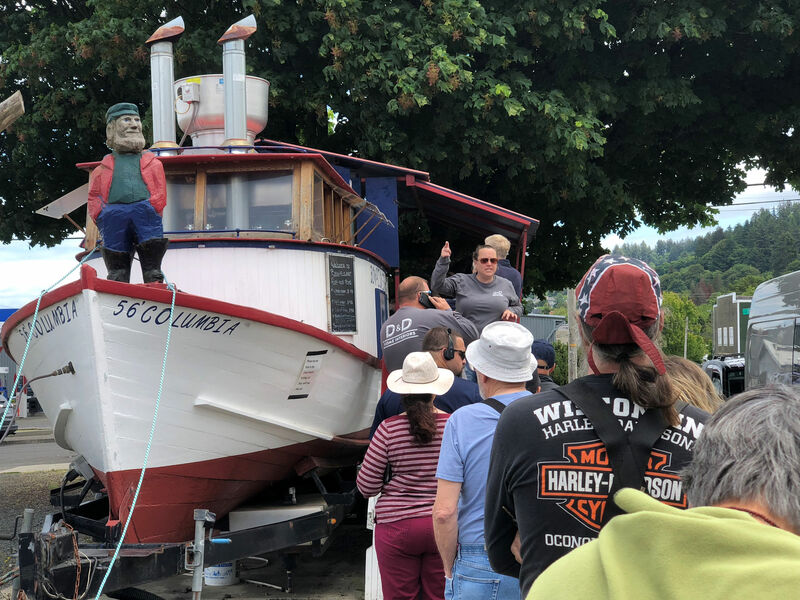 A line of people faithfully waits to buy food served from a Columbia Bowpicker. The Bowpicker was easy to find as our friends had described it: in the shape of a boat, with a line stretching down the block. 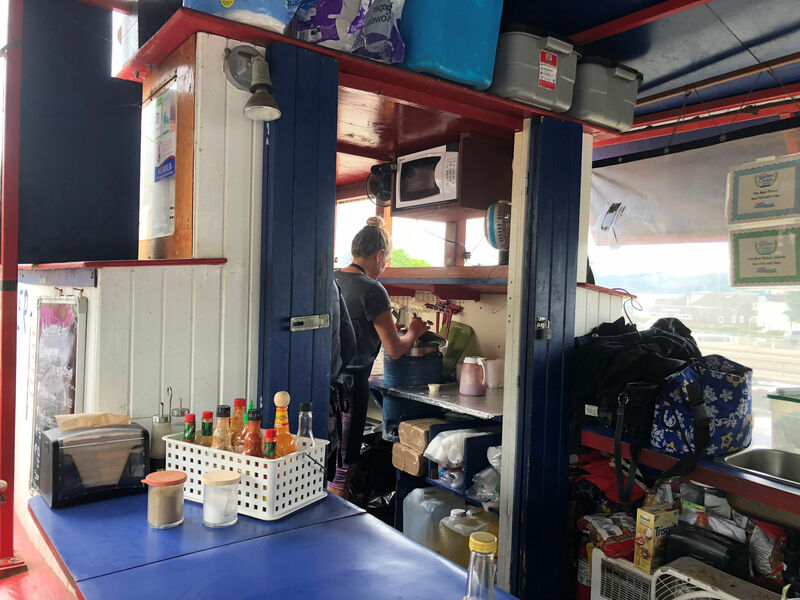 Turns out, the eatery occupies an actual converted gillnet boat, which makes it a great tourist draw. By the size of the line, I was anticipating the best fish&chips of my life. There are four menu items, but three are merely a variation on a single menu item. 1) whole order (5 pieces w/fries) 2) half order (3p w/fries) 3) fish only 4) fries only. You are standing next to what was known as the Columbia River Bowpicker. These boats were 28 feet in length. They were planked with Port Orford Cedar, oak frames, and Douglas fir cabin and deck. These boats evolved from double-ended boats from the 1870s that used sails as their power source. By the 1920s, all boats were powered by 6 to 10 hp single piston engines. By the 1940s and 1950s these boats became the modern version you see here; square stern and powered by V8 marine engines. During this period, there were hundreds of these boats anywhere on the Columbia River. The Bowpickers fished for salmon and sturgeon on the Columbia and other waters of the Northwest. They employed long floating gillnets, hundreds of feet in length, that were retrieved from the bow of the boat. The fish were then picked out of the net. Thus the name Bowpicker. Lunch! Note persistent seagull in background. We finally got our meal of fresh Albacore tuna and thick slabs of potatoes. We tasted them while fighting off a pigeon and a seagull. I’d give the meal a B+. Definitely fresh. Clearly real fish steaks. Cooked at the proper temperature, so not greasy at all. The batter was too bready and seemed heavy, and not very flavorful. Satiated, we took off for the Astoria Column. We traveled in to Astoria from the east, so were still miles from the beach itself. I know, it’s not original, but for anyone who has never been here, it’s a must-see to get your first views of the ocean from the column and its astounding vantage. City of Astoria in the foreground, bridge across the mouth of the Columbia River, Cape Disappointment in the background. We crossed the bridge of another tributary river (just out of sight to the left of the image above), and went to Fort Stevens. 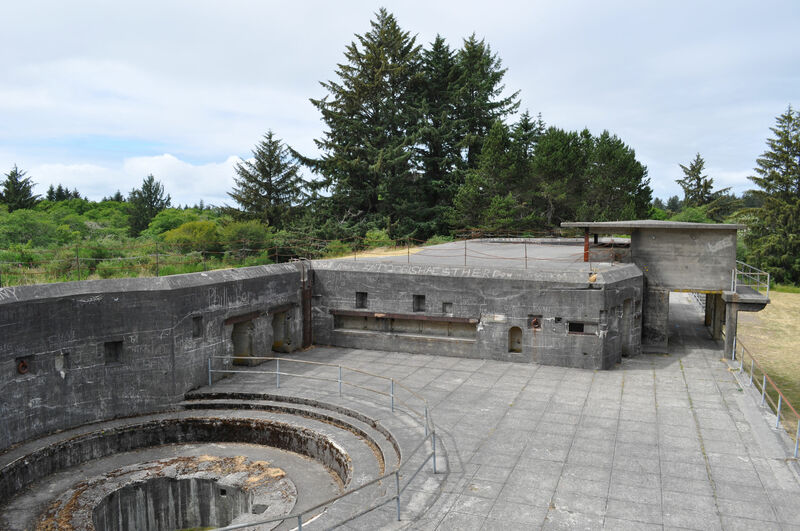 Fort Stevens was once part of a military defense installation at the mouth of the Columbia River. The fort saw service for 84 years, from the Civil War to World War II. Today it is a park with multiple camping options and fun stuff for day visitors. The remains of the old fort are still here (in fact, we saw military remnants at many stops in the area today), and visitors are allowed to climb all over them at our own risk. “Caution: beware of unprotected drops and open pits.” haha. We poked around, trying to identify what each structure was for. Standing atop what’s left of the main Fort Stevens structure. There are many small bunkers scattered in this area. The trees are newly grown and when the Fort was in use, it had a clear view of the Pacific Ocean. Next stop was finally the beach itself. We parked and walked out onto the sand, being drawn to a shipwreck, as many people are. 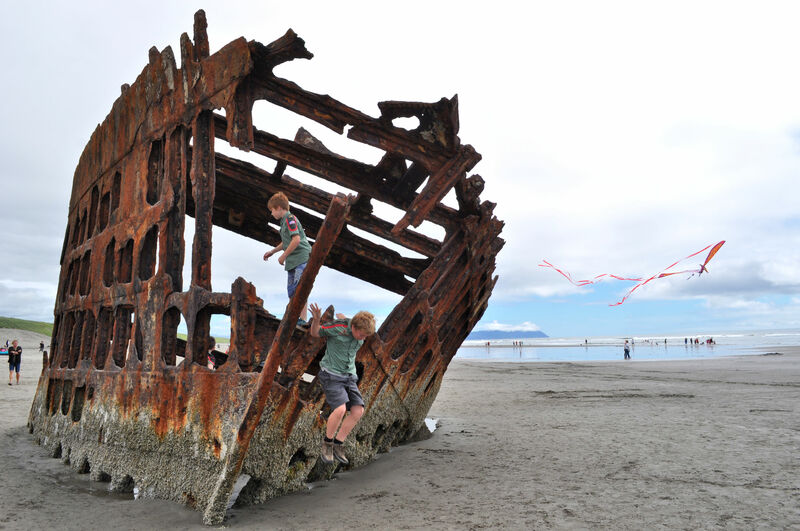 The Peter Iredale was a four-masted steel barque sailing vessel that ran ashore October 25, 1906, on the Oregon coast en route to the Columbia River. 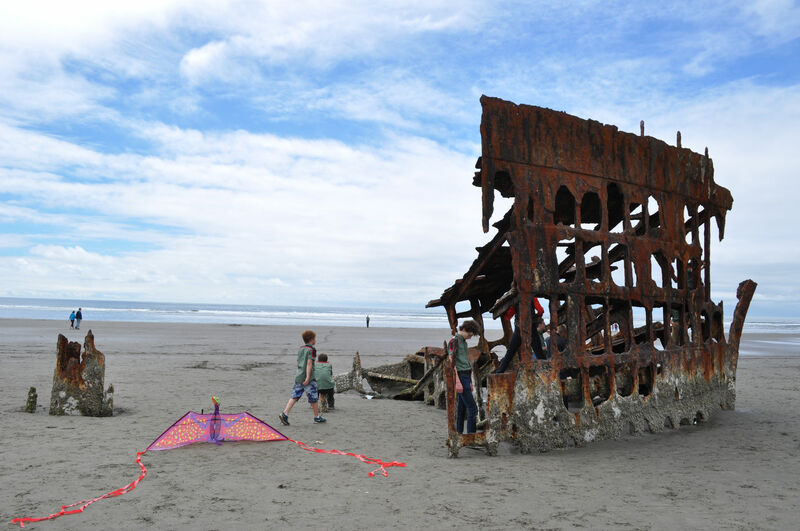 It has been slowly decomposing and generations have returned to walk around it and climb upon it at low tide. I love that I captured the boy in mid-leap. The kite also adds to the scene. 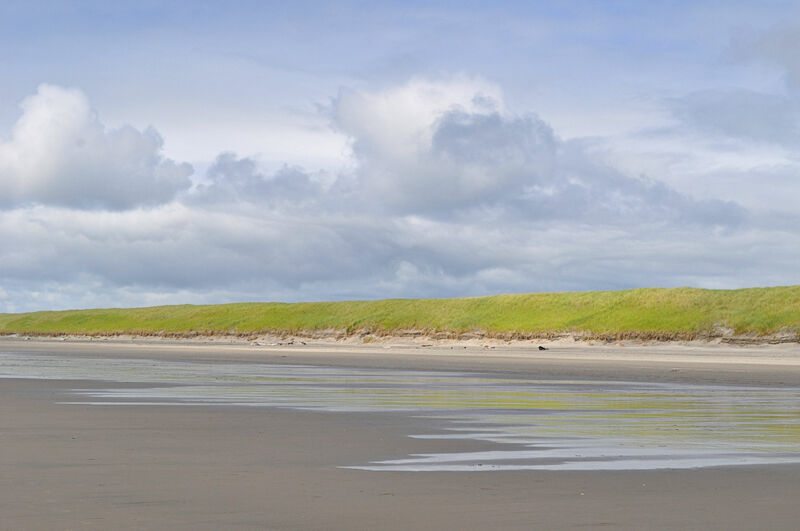 The Peter Iredale ran aground October 25, 1906. Now it’s a playground for boys in uniform. Looking north along the beach we could actually see the jetty at Cape Disappointment, in Washington. Vlad and I walked up the beach a spell, spotting fishing vessels on the horizon, enjoying the smells and sounds of the sea, then turned back to the Jeep. It felt strange getting to the beach and then leaving. But this was not a beach trip and rather a Let’s-get-a-look-at-the-land trip. We crossed the magnificent Astoria-Megler Bridge to Washington state (that’s the one you see in the photo above). The southern part of the bridge is extremely high to enable free passage of any kind of ship up the river. And we do get everything in Portland: enormous tourist cruise ships, tall-masted sailing ships, Navy ships, and every kind of ship and barge for commerce. The bridge has no means of opening or lifting, and rather is built very high, which is exciting for motorists! It is just over 4 miles (6.55 km) to cross the river. 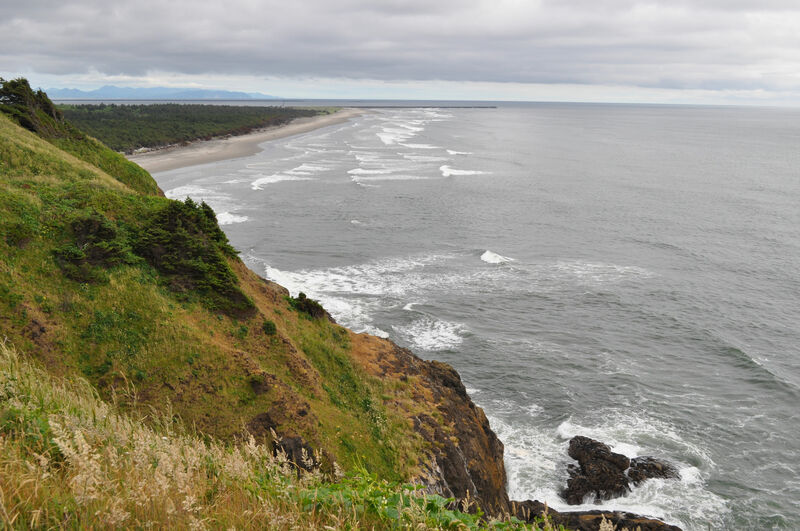 On the Washington side we turned immediately for Cape Disappointment, named when an explorer had tried and tried to find the mouth of the Columbia River and was forced to admit defeat. Ironically, at the mouth of the very river. My Discover Pass came in handy one more time this week. I purchased it in October to park at the trailhead when I hiked the Enchantments. Anyone who lives around here and does some exploring in Washington state should have one. They’re $10 for a day pass, but only $40 for a year. Many of the parking lots to recreational areas require one, so it pays for itself easily if you get out of the house. We had free admission to Mt. 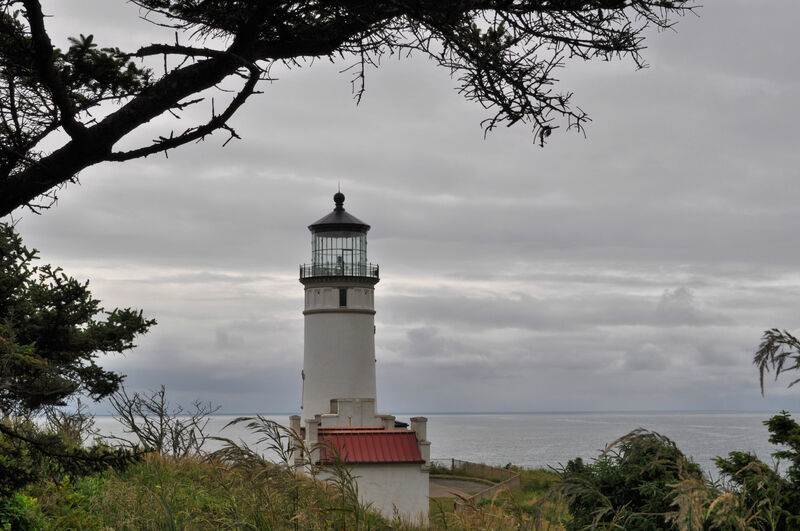 St. Helens observatory, and now free parking at Cape Disappointment. We hiked the first trail lined with informational signs about weather in the region. For two people with a weather background, the signs are interesting for different reasons than most people I imagine. Personally, I like to see how weather is explained for the layperson. But also, knowing weather, I skim through all the facts and see what is impressive based on my own knowledge. For example, coastal wind speeds can exceed the minimum requirement for hurricane wind speeds. That’s a fun perspective. The end of the informational weather trail. 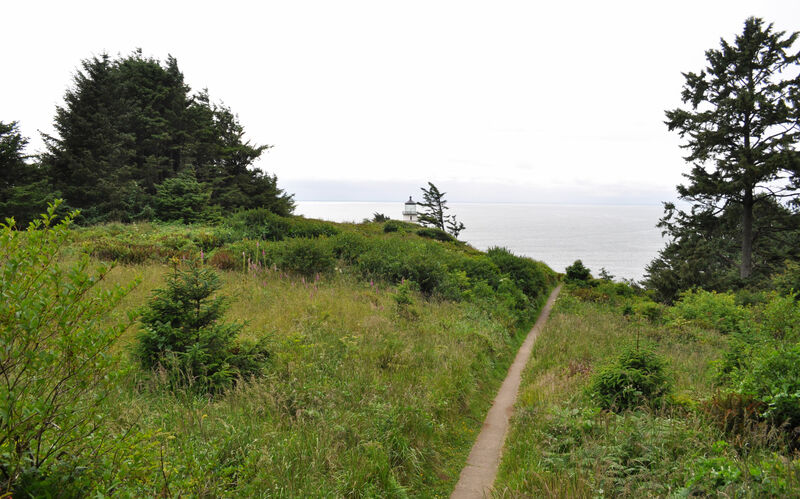 Trail to North Head lighthouse. Can you see it, smack in the center of the photo? 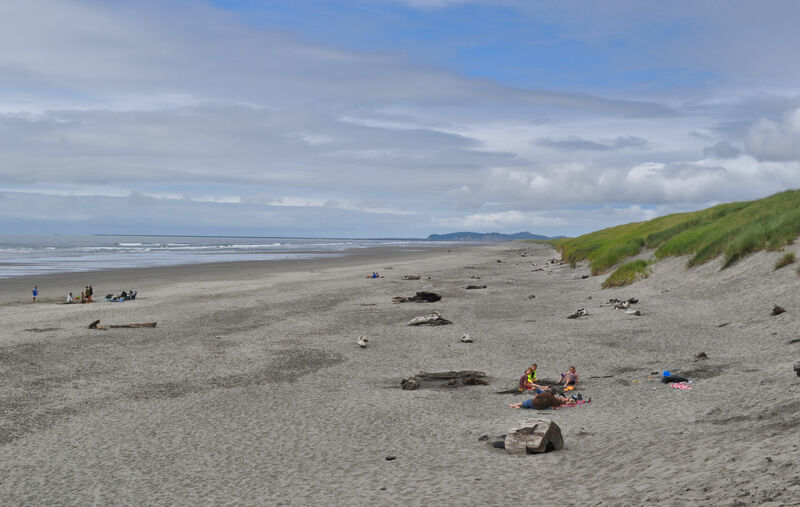 This is a view of the jetty looking south from Cape Disappointment. The mountains in the distance are Oregon. I then gave up my plans to head along the smaller road in Washington and catch the ferry back to Oregon. We had been out all day. We had been out all week, actually. My vote was to cross the bridge back to highway 30 and head home by the quickest route. Vlad agreed. All in all it was a successful week of exploration. I hope my friend now feels more keenly his place on this particular spot of the Pacific Northwest.